Adolph Schauder emigrated to the United States from Germany in 1893. He settled in the northern Wisconsin town of Rhinelander. Adolph brought nothing with him other than leather so he could reestablish himself as a shoemaker and provide for his family. He was able to purchase a two story building in downtown Rhinelander on Brown Street. His shop was on street level and the family living quarters were directly above. Four generations continued this business until it was closed in 1989 having operated for 96 years. There were no heirs to inherit and continue the business. It is not exactly clear when Adolph had this incredible trade sign created, but we have been told by family members that it was created and put in place in the earliest part of the 20th century. At some point, the shoe was taken down from its outside display area and relegated to the basement. A family member recalls that often on the Fourth of July, the shoe would make an appearance in the town parade with family members strapping it to the roof of the car for all to see and remember. After the shoe store closed, the new owner of the building held an auction to dispose of various items left in the building. The consignor of this item attended the public auction at the shoe store's location and was stunned to see this fabulous item that was never even mentioned in the auction flyer. Due to age and the wish to downsize, they have decided to liquidate and consolidate their various treasures. At first appearance, one thinks of this as a boot, but in reality, it was designed as a shoe and the white glass actually simulates a spat. The lettering "S&S" is done in burgundy glass and was perhaps meant to represent Schauder & Son. The heel of the shoe is actually a tin surround with an opening at the bottom. The top of the shoe has a covering and most likely at one point had an electrical fixture to light up the shoe. A hole on the underside of the shoe would allow for easy access to change the light bulb. Although the actual glass pieces have not been counted, it must easily be in excess of a few hundred pieces. As one would expect, there have probably been some aged repairs to some of the leading and glass tiles, but the piece is firm, solid and intact. 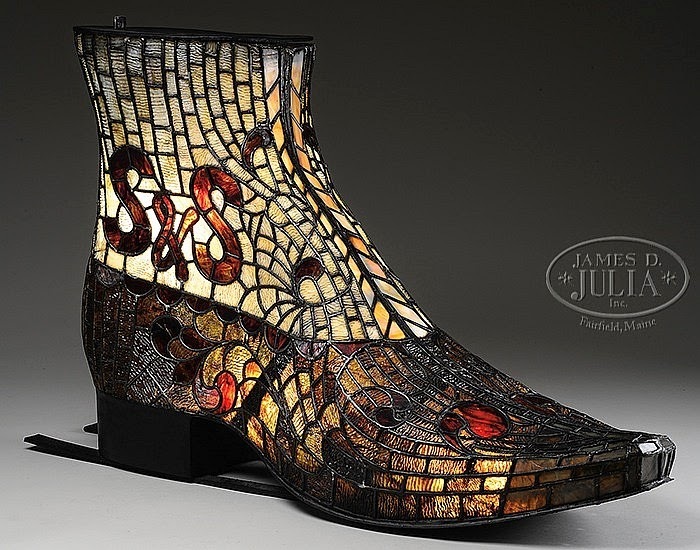 The shoe itself utilized amber colored glass to simulate leather and as previously discussed, the spat is a creamy white with the burgundy S&S lettering. The toe area of the shoe employs a different style of glass being of a green color. Truly an amazing and most important folk art trade sign to come fresh to the market and undoubtedly a once in a lifetime opportunity to own a piece of this magnitude. Available at James D. Julia.